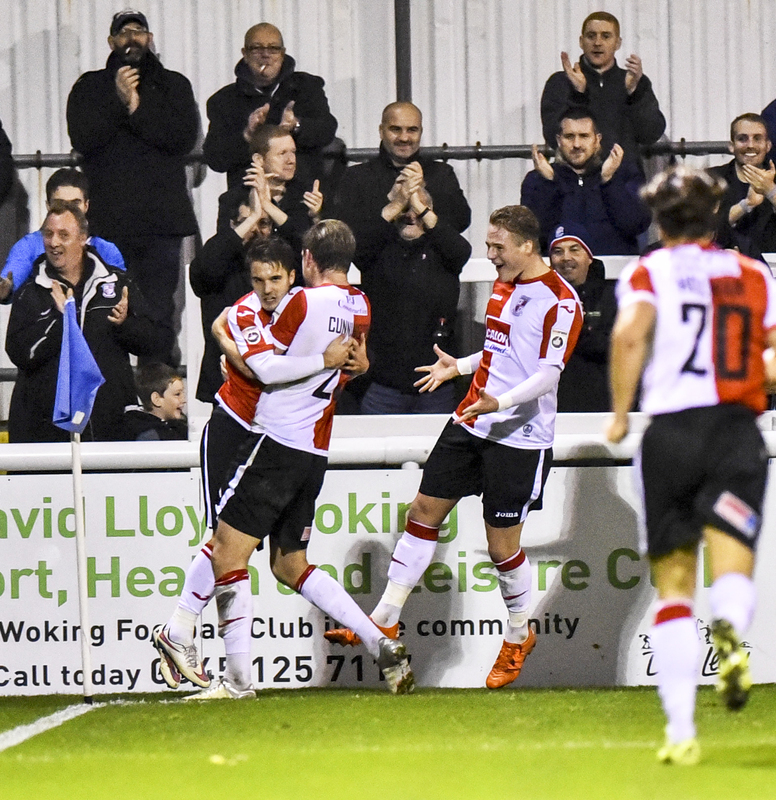 GRATEFUL Woking left it late to salvage a share of the spoils against a battling Braintree side, who will have felt disappointed to head back to Essex without maximum rewards on Tuesday night. A close-range strike in the 23rd minute from striker Sean Marks had seen the visitors good value for their lead, one which they held for over half of a game that ebbed and flowed, but without any undue concern for either goalkeeper. An enthusiastic Iron side certainly set about their business in the mould of impish young boss Danny Cowley, who at just 36 years of age certainly provided a child-like sideshow with his attempts to rile Garry Hill and Steve Thompson. Livewire Town midfielder Sammi Szmodics almost doubled Woking’s misery on the night with an impudent lob, the product of a team oozing with confidence – with only a superb fingertip save from Cards keeper Jake Cole keeping the hosts in the game. The Cards management duo certainly let their feelings be known to Cowley to quieten the boisterous away bench when John Goddard stole in to equalise with 13 minutes remaining. While the plucky visitors bemoaned the injustice of two points thrown away, Hill and Thompson will hope that Goddards’ ninth goal of a stuttering season could provide the impetus to build on what is just their second league point in a month. Any neutrals among the Kingfield crowd on Tuesday evening would have filed away into the mild November evening thinking that it was the string of listless performers in red and white, rather than in blue and white shirts, who had played in an FA Cup tie with Oxford United little over 48 hours earlier. While Woking made fleeting inroads on the counter attack through the likes of young winger Kadell Daniel, with a snap-shot here and there from forward Dan Holman, a guileless Cards side all too often seemed content to hit the ball long to new target man Adam Cunnington. All received little change from markers Matt Paine and Matt Fry at the heart of a well-drilled Iron backline. With a crunch league game to come against Macclesfield Town at The Laithwaite Community Stadium this Saturday before a testing trip to Chester the following weekend, Woking fans will be hoping some of the tenacity on display at Kingfield on Tuesday night will rub off on their team soon.